Our Advancing Abstraction series will help you take your work to the next level. This edition brings together Cornwall based artists Kerry Harding and Marion Taylor who explore a paint and process led approach. This course will build your skills and confidence so you can create rich and expressive oil paintings. You will learn to capture the shape, colour and essence of a still life arrangement of spring flowers. The tutor will guide you in the use of oils so you develop your own rich painterly style. Bold colourful arrangements in the studio will be your inspiration and you will work on both canvas and board using brush and palette knife. This course is about learning creative ways to capture the human form. Through exercises and experimenting with materials, you will explore three key approaches. Break out of the constraints of realism, explore the use of space and harness the power of the accidental to tap into your emotional instincts and imagination. The inspiration for this five-day course is a trio of renowned artists that worked in St Ives at the height of the modernist era. Delve into the abstracted forms of Barbara Hepworth, the vibrant collages of Sandra Blow and the intense mark making of Wilhelmina Barns Graham. You will be emerged in the very same environment that inspired them. Visit the Hepworth Garden and work in the Porthmeor studio complex that overlooks the ocean. Develop your own response using painting, drawing, simple printmaking and collage. 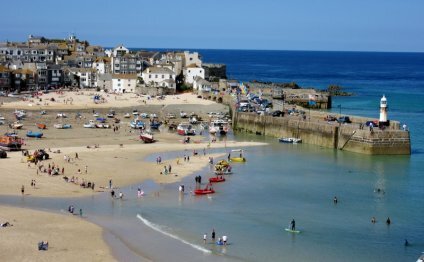 Over the five days, you will form your own personal response to your time here in St Ives. This is a chance to paint confidently with a palette knife in oils working in the historic Porthmeor studios and from the dramatic coastline around St Ives. Artists are fascinated and challenged with looking through windows in their work. Vermeer, Pierre Bonnard and Winifred Nicholson each found their own solutions. This course examines particular problems with tackling space in paintings. It gives you insights and skills developed by artists to overcome these challenges. Over the three days, students will paint still life with views of Porthmeor beach and St Ives from the studio windows. You will work towards developing and completing a single large scale painting in oils. Explore an expressive approach to capture in oils the dramatic encounter between the sea and the land. On visits to beaches around St Ives, you will observe and sketch the coastline. You will learn how to work with gouache to make annotations on colour and weather. Back in the studio, develop these visual notes and sketches into lively and dramatic oil paintings. You will gain confidence in using a limited palette and work with a palette knife to capture drama and movement.